Peruvian researchers have discovered a previously unknown species of viper, whose representatives live only on the territory of the Bauha-Sonin National Park in the south-eastern part of the Peruvian Amazonia. These reptiles are endemics of the savannah zone of the Madre de Dios region, bordering Bolivia and Brazil, the National Service of State-Protected Areas (Sernanp) reported. Scientists have assigned the name of Bothrops sonene to a new kind of poisonous snake – by the name of the river, which flows in the region of Madre de Dios and in the language of local Indians sounds like Sonene. This species of reptiles differs from others in that its representatives have a light green color with spots in the shape of the letter “C” on the back and a peculiar shape of scales on the head and body. The researchers found that Bothrops sonene belongs to the family of viper or viperovyh. They have a pair of relatively long, hollow teeth inside, which are used to release poison from the poisonous glands behind the upper jaw. 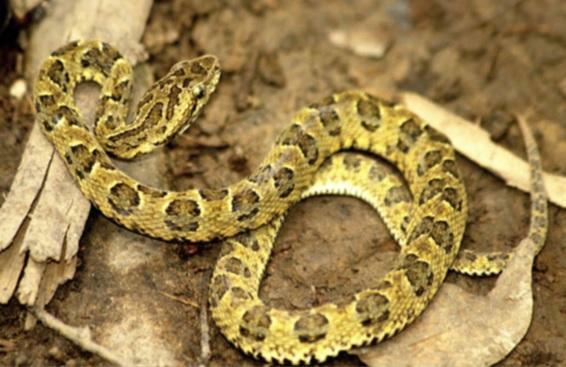 A new species of viper was discovered by researchers during a general monitoring of the biodiversity of the Bauha-Sonone National Park. It was attended by Peruvian and foreign scientists from various specialized centers for the study of flora and fauna. The Bauha-Sonone National Park, which currently covers more than 1 million hectares, was created in 1996 to preserve the moist forests of the Amazon. On its territory grows about 20 thousand species of plants, about 600 species of birds, 174 species of mammals, about 100 species of reptiles and amphibians, 232 species of fish and more than 1.3 thousand species of butterflies. Previous story Malay bears can copy each other’s facial expressions.